Bike and Barge â€” Belgium to Amsterdam â€” 8 touring days! Meander through the Fall landscapes from Ghent, Belgium to Amsterdam. With eight days of cycling we take our time and enjoy more sights and famous towns. Our unique Fall adventure will enjoy autumn colors while visiting famous Ghent, Brugge and Antwerp before cycling north to discover walled towns of South Holland, a dutch shoemaker, a medieval castle, working windmill and more! We are welcomed onboard at 11 a.m. and keep our luggage stored while the boat is being cleaned for us. No time to waste, we want to start our exploration of the great city of Ghent. An impressive university town and canal city, Ghent was medieval Europe's largest city outside Paris. Sitting on the junction of the Leie and Scheldt Rivers, it was the seat of the counts of Flanders who built the fearsome castle, Het Gravensteen, that we plan to visit on our town walk upon arrival. One of Suzie and Roger's favorite Belgium destinations, we know you'll love impressive Ghent! Our friend, Dany Hendryck, will be entertaining us also today to show us some "locals" parts of his city! Take a quick look here at a nice piece on Ghent with Simon Calder. After breakfast we train to the lovely town of Brugge. This beautiful medieval city complete with picturesque market squares, serene canals and whitewashed almshouses is everything you expect from a UNESCO heritage site. After several hours of exploring we take the train again to meet our boat in the small town of Denderemonde. For those that would like, we will take a spin around the tiny city center dating back to prehistoric times along the Scheldt River running through it. After breakfast we start our journey by cycling along the beautiful Scheldt River north to Antwerpen. The Scheldt which meanders from France through Belgium and then via the Netherlands towards the North Sea, has since Roman times been of commercial and strategic importance. We will enjoy the lovely path along the Scheldt, departing from it several times to explore the colorful Flemish countryside dotted with lovely farms and beautiful castles- we love to visit. We arrive in Antwerp and see right away how Antwerp is the world's second largest port. Our boat is docked in the Antwerp's Willem Dock -the second of two first docks constructed in 1811 by Napoleon Bonaparte who recognized the city's potential. Our first adventure will be a visit to Museum aan de Strom recently built in 2011 - where a succession of external escalators decorated with outside exhibits takes us to an open roof for a remarkable view across Antwerp. After breakfast we head to the city center for a guided tour of Antwerp. Today we see firsthand that Antwerp is a beautiful city with a rich history. Some of our stops today will be at the famous castle -Het Steen- on the Schelde River, the beautiful Market Square lined with the impressive 16th century guild houses, the palacial house of famous painter, Peter Paul Rubens. The day affords lots of independent sightsee time and enjoyment of this also vibrant and fashion conscious cosmopolitan city. We leave Antwerp following new bike paths contructed along the forrested train routes traveling north. After quiet cycling in the Flanders nature reserves we stop for lunch at the Dutch border at an old estate called Ravenhof. Our route today passes more quaint villages in the Dutch Brabant region and a longer visit to the famous town of Bergen Op Zoom-once a great fortress town from 1200s- where we'll explore its beautiful town center. Soon after we cross into the province of Zeeland to meet our ship in the tiny town of Tholen. Those that desire to sail will go onboard for the short distance to our destination of Willemstad. Once a fortress town created by Willem of Orange-father of the Netherlands-when struggling for independence against the Spanish rulers-these days Willemstad still boasts the preserved fortifications of its past witin a lovely town setting. We sail early this morning and are dropped a bit eastward to start our cycling. Following the beautiful Amer River gifts us lovely views of the Biesbosch National Park â€” one of the largest, valuable natural areas in the Netherlands, it's also one of the few remaining fresh-water tidal areas in Europe. We're headed to an "Ambachtlijke" traditional Dutch shoemaker-Pieter Den Dekker. Here we enjoy cake and cofee and then he'll show us his old craft only practiced today by a few passing on an honored trade. After our visit and stop for lunch at a nearby castle grounds, we head to Gorinchem. Part of the impressive "Fortress Triangle", Gorichem's fortifications with bastions built in the sixteenth century are still almost completely intact. We'll take time to explore the city with a town guide and enjoy a drink in one of the cozy cafes on the historic city square. We start pedaling northeast and enjoy a meandering bike route along the Linge River and Fall landscapes of the Betuwe region â€” Holland's largest fruit producing area also known as the "Orchard of Holland". Fall is prime apple season and we'll stop for a visit to one of the Orchards and enjoy a talk by the farmer and a coffee and fresh apple cake baked on his farm. 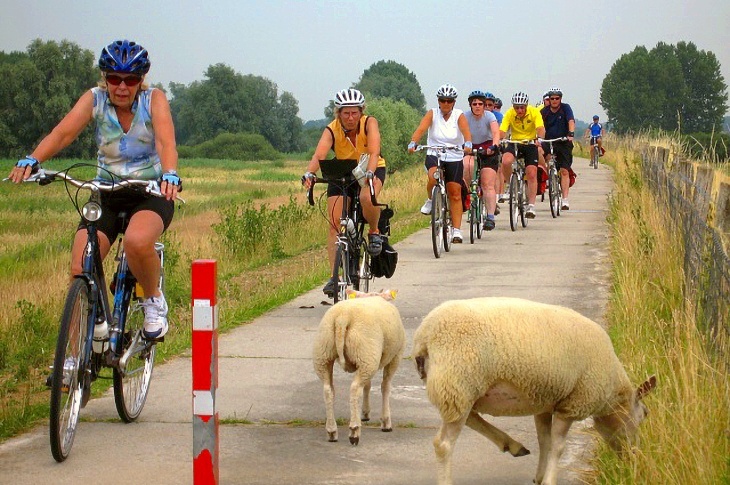 We cycle north again to join the Lek River and pedal along the dijk until the town of Vianen. Vianen is a medieval fortified town located in the polder area De Vijfheerenlanden. Within the canals and city walls, the strict geometric street pattern of the Middle Ages has been preserved. We will take time to visit the beautifully preserved Town Hall (1425/1473) and Great Church (1542). Time remaining we may be able to take the bus to the vibrant city neighbor, Utrecht, for a walk in the historic center. The Tijdgeest sails us to the quaint town of Breukelen where we start our cycling with a picturesque meander along the famous Vecht River- a region of centuries-old villages, expanses of pastureland punctuated by windmills, castles, and stately mansions built by Amsterdam merchants as weekend retreats during the 17th and 18th centuries. At the town of Vreeland â€” one of the smallest villages on route we'll stop to visit the working windmill- De Ruiter- which grinds it's own grains and sells to the public on Saturdays. Nederhorst den Berg will be our final stop along the Vecht where we'll see the castle and enjoy a treat of Pannekoek (typical Dutch pancakes) for lunch. After this we head for the Rhine Canal and cycle a quiet path leading us to the center of Amsterdam. This evening we'll celebrate a fun adventure with a special Farewell Dinner. Day 9: Depart boat and goodbyes! Sunday morning we enjoy breakfast with our friends. At 9 a.m. we say goodbye to Skipper Gerritt and crew and depart our home for the week- The Tijdgeest! Roger and Suzie your tour hosts and ride leaders! Walking tours in Ghent, Brugge and Antwerp, several excursions and visits for example to a shoemaker, castle, windmill; train fares during the tour, bike ferries, stops for group treats, and other surprises Suzie finds along the way! Afternoon snacks onboard and stops for traditional Dutch food treats! To access our boat in Ghent- there is excellent direct train service to/from Brussels city center and its Zaventem Airport and Antwerp which connects to high-speed trains coming from Amsterdam. Our boat is docked on the Sluisweg-located a short taxi ride from Ghent St. Pieters Central train station and accessed by several buses which stop nearby the boat. As with all European trips, we advise our cyclists to arrive a few days before the trip start to acclimate to the time change, get acquainted with the new culture and sightsee your arrival city. We also suggest you make plans to depart a few days after your trip ends if you would enjoy sightseeing Amsterdam. Transportation information is explained more in depth in your Welcome Letter sent upon trip registration. We are delighted to host again on The Tijdgeest with Skipper Gerritt van Terwisga. Gerritt bought the Tijdgeest over 10 years ago and is proud of his ship and service to his guests. The ship has been updated a number of times in the last few years to feature remodeled cabins, a beautiful eating salon and an enlarged kitchen where the Tijdgeest cook proudly creates our delicious meals. Information about your trip, what to pack, pre-trip transportation and lodging in Ghent, traveling abroad, tips on airfare, and other important pre-trip details will be provided in your WELCOME LETTER sent to you when we receive your registration for the trip.